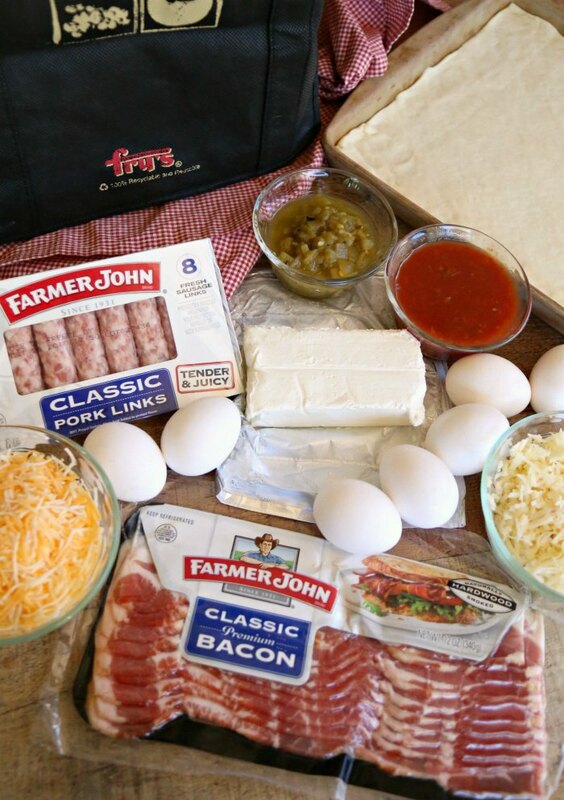 This delicious Southwest Breakfast Pizza Recipe is a sponsored post by me on behalf of Farmer John®. The opinions and text are all mine. Who else loves a good, hearty breakfast?! With 3 growing boys, breakfast is definitely a popular meal at our house every day! 😉 On some days though, I like to kick breakfast or brunch up a notch – especially when we have guests visiting, on some fun weekend mornings (like during college football season with morning games), and over the holidays! 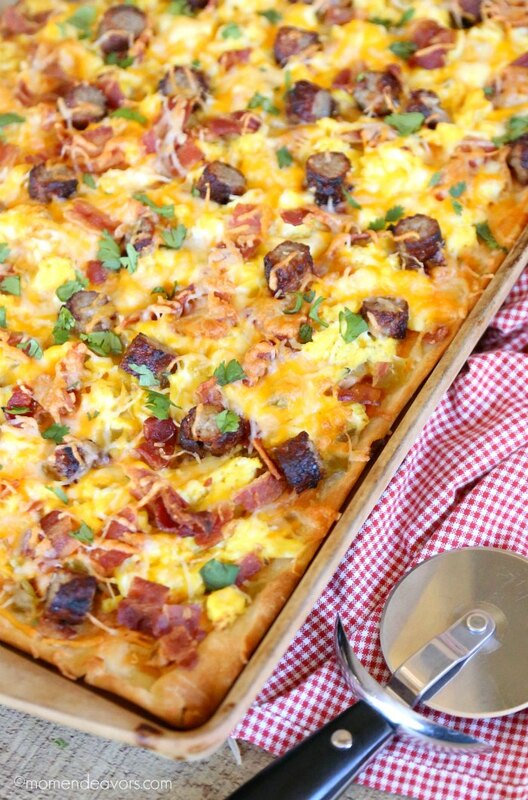 Those special times call for an extra-tasty breakfast and this Southwestern Breakfast Pizza is a delicious choice! 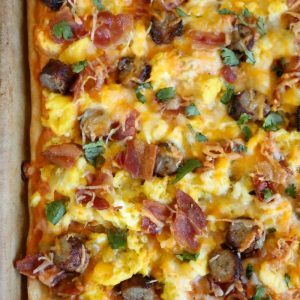 You just need some standard breakfast ingredients, plus a few Southwestern flavors to create this fabulous breakfast pizza! I picked up everything I needed at Fry’s. 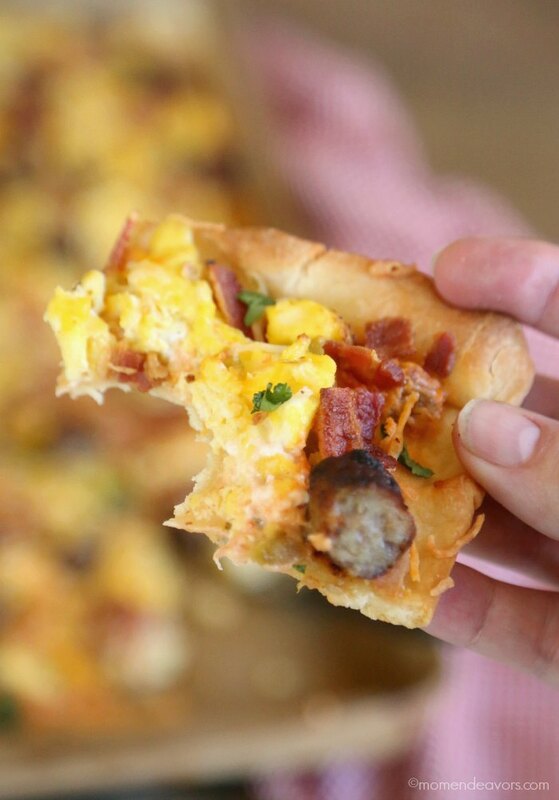 In addition to the obvious need for eggs and cheese, we also used Farmer John® Pork Sausage Links and Farmer John® Classic Premium Bacon to really get all the delicious breakfast flavors in there! We went with the classic varieties for this dish (I love that the bacon is hardwood smoked). But Farmer John has other quality options that you could try as well, like Maple Pork Sausage Links and Old-Fashioned Maple Bacon (both made with real maple syrup), Thick Cut Bacon for those who like a meatier cut, and Lower Sodium Bacon with all the flavor, but 30% less sodium per serving compared to Farmer John Classic Bacon. YUM! Then, for that West Coast/Southwestern flair, we used green chiles, salsa, pepper jack cheese, and cilantro. And don’t worry – if you’re one of those “cilantro tastes like soap” people, you can just omit the cilantro. No biggie! The end result is this DELICIOUS creation! Doesn’t it look good? 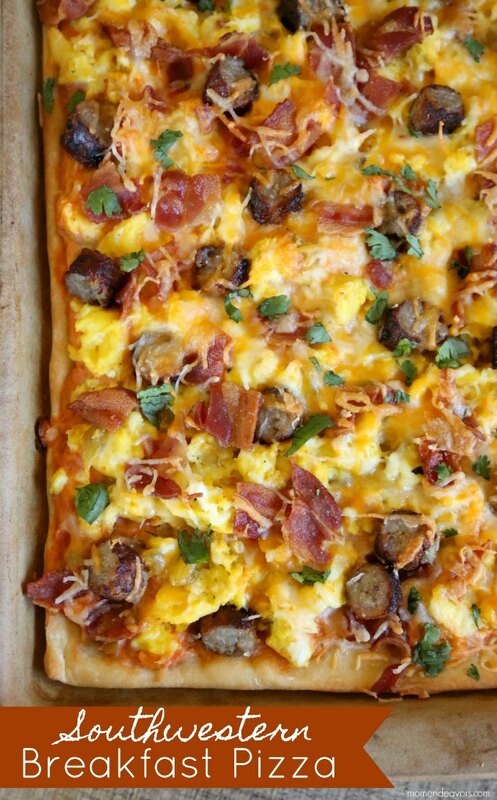 This really is an easy recipe to create, with not much more work than just cooking up a regular big breakfast. You’ll start by prepping the pizza dough. Use your favorite homemade recipe or store-bought dough. 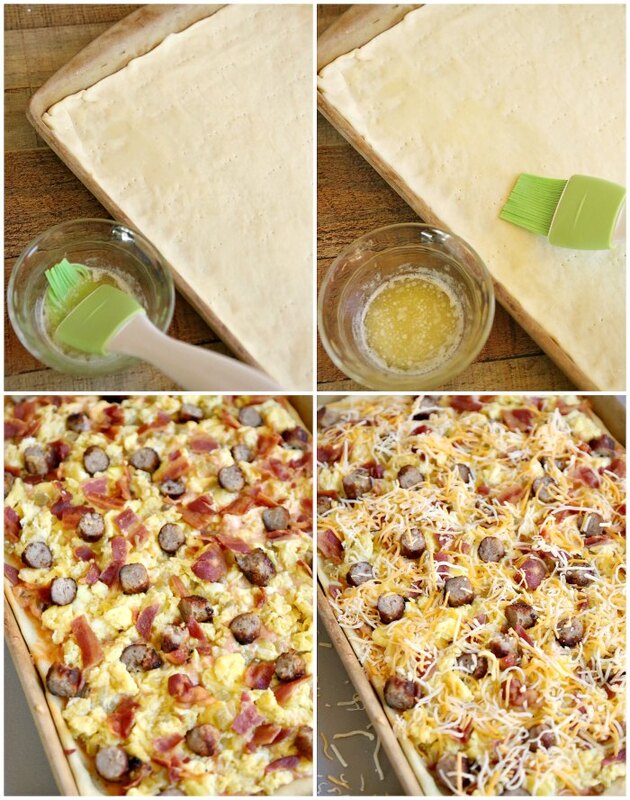 I prefer to put the dough in a large cookie sheet pan instead of rolling it into a circle, but you can do whichever method you prefer! Once your dough is rolled out on your pan of choice, poke the dough with a fork and brush with 1 Tablespoon of melted butter. You’ll bake that in the oven for about 7 minutes. 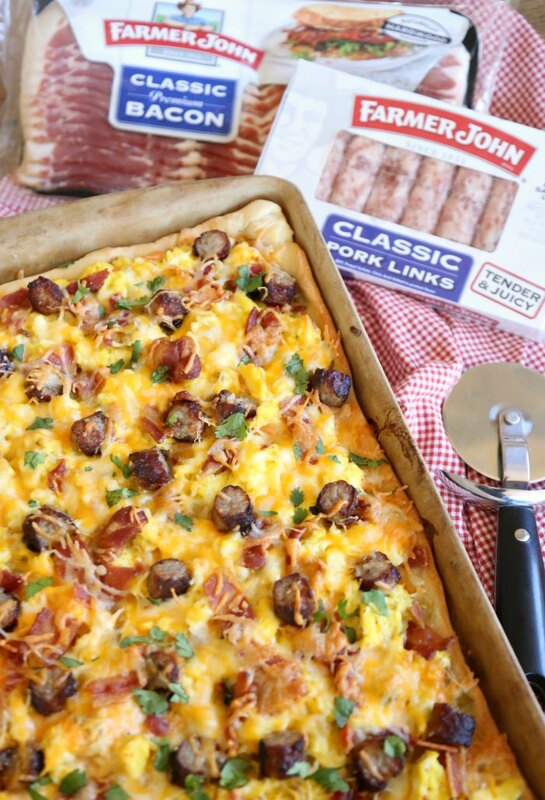 While the dough bakes, cook up the eggs, Farmer John Classic Premium Bacon and Pork Sausage Links. You’ll also prep the breakfast pizza sauce to go on the pizza – that is a mixture of salsa, cream cheese, and pepper jack! In a small bowl, combine salsa, cream cheese, and pepper jack cheese. Stir until ingredients are mixd well. Set aside. While dough bakes, cook Farmer John bacon in a pan and Farmer John sausage according to package directions. Once cooked, chop up bacon and slice sausage links. Set aside. In a small bowl, combine eggs and milk. Whisk together. Pour contents into a greased pan to cook scrambled eggs. As the eggs being to cook through (about mid-way through cooking), pour in the green chiles and stir combine. Once eggs are done, remove from heat and set aside. Remove pizza crust from oven, spread a thin layer of the salsa and cheese mixture (this is your "pizza sauce") evenly over the warm crust. 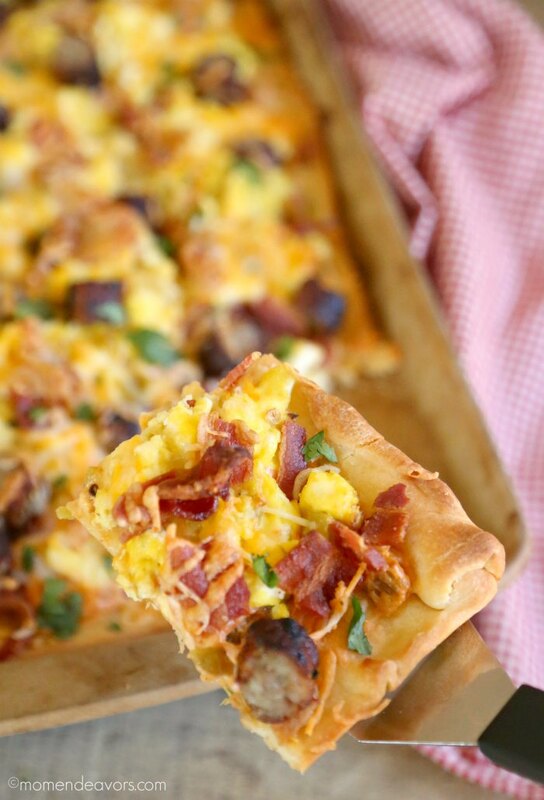 Spoon scrambled eggs mixture evenly over the crust. Add the chopped bacon and sliced sausage. Sprinkle with remaining cheese. Remove from oven and garnish with cilantro and/or green onion if desired.